Register Today! Community Shifting Gears returns this May! April 25, 2017 – As the weather warms and we pack those winter layers away there is an eagerness to spend more time outdoors, lighten up with some spring cleaning, and make some changes alongside the new season. So, what better time to begin Community Shifting Gears! 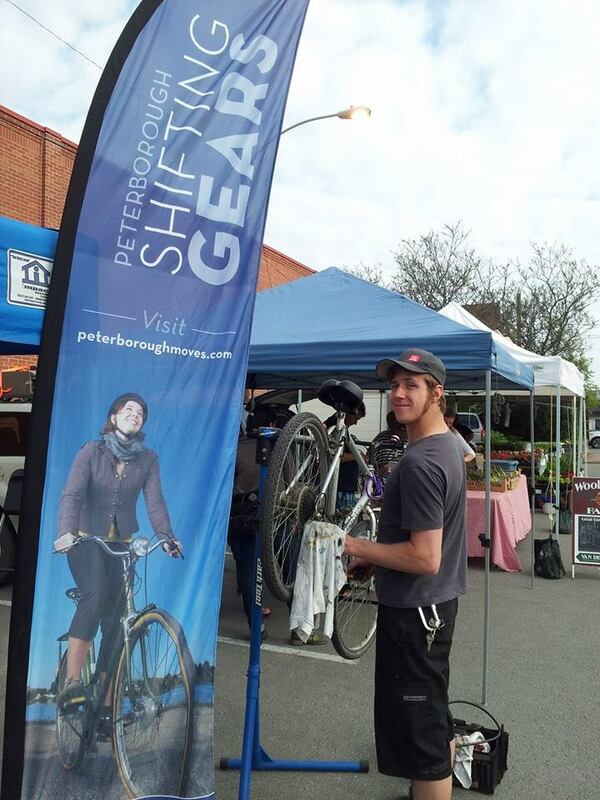 Peterborough’s annual sustainable transportation challenge, Community Shifting Gears, runs from May 1st to the 31st. Community members can register to log their trips on-line, and then work through the month towards their own goals for increased walking, biking, transit trips, and/or carpooling. But, they won’t be alone. They will be part of the Shifting Gears community. During the month of May, participants will receive tips, information, and encouragement that will help them reach their goals. They will learn from fellow profiled participants how they can make the shift to active and sustainable transportation. Community members can register as individuals and compete against each other for weekly draw prizes for Peterborough DBIA gift cards and the grand prize of a $750 to Resorts of Ontario. Also, new for this year, the first 500 to log 15 sustainable trips this May will receive a special incentive to help them in their shift towards walking, biking, or taking transit. Workplaces, high schools, and community groups can join the challenge as a team again this year. They will compete for the coveted Travel Wise Awards in the categories of Micro, Small, Medium, Large, Master Class, High School, and Community. Groups who sign up are eligible for customized workshops, including Cyclist in the City, Bicycle Therapy, and Route Planning, and services, including Bike-friendly Business/School Audits and Active Transportation Policy Development. Whether you join the challenge as a team, or as an individual, there are all kinds of community events and workshops to take advantage of this spring. Visit the Community Shifting Gears booth at the Downtown Farmer’s Market Wednesday’s through May, and at the Saturday Farmer’s Market on May 6th, to get a quick bike tune-up, do some route planning, and ask all your questions about how best to get around town. GreenUP and B!KE are offering Bike Night events April through September with activities for all ages and abilities. Or, take a tour of Peterborough by Bike, with Sue Sauve from the City of Peterborough, to learn about how to use the new bike facilities popping up around town. Last, your Shifting Gears Ambassador, Lindsay Stroud, is available to work one-to-one with you, your school, or your workplace to help you find solutions to the hurdles in the path of your shift. We know that a range of positive impacts result from active and sustainable transportation, from better physical and mental health, to improved air quality, to lower family transportation costs, and reduced demand on parking spaces. Community Shifting Gears is here to help you prepare and plan for your shift! Community Shifting Gears is a program provided by GreenUP and the City of Peterborough, with the generous support of Peterborough Public Health, Wild Rock Outfitters, and B!KE: the Peterborough Community Bike Shop. For more information on Community Shifting Gears, please visit.peterboroughmoves.com or contact at GreenUP, 705.745.3238. ← Bike Night every Thursday – workshops and rides!